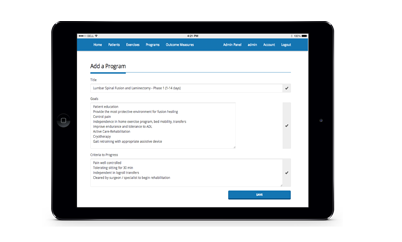 The only custom exercise prescription software with in built rehabilitation programs and integrated outcome measures. Integrate the latest clinical research into your rehabilitation programs. And know we are updating it all the time. Most major outcome measures are supported, with more being added all the time. Have patients complete the outcome measure in your office using a tablet or other device, and you get the score immediately. Email outcome measures to patients for them to complete online in their own time. Easily view and track progress with graphed results. 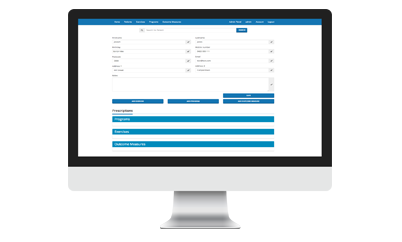 Complete step by step rehabilitation protocols that you can prescribe simply with a few clicks. Developed (and frequently updated) to reflect the latest in peer-reviewed research. Email exercise programs directly to the patient or print out as needed. Specific exercises searchable by name, condition and indication. Prescribe in just a few clicks. Email directly to the patient or print in office. Prices in Australian Dollars for Australian & New Zealand clinics, US Dollars for other locations. Need more users? Run lots of clinics? Contact us for a custom plan. Erepsonline places at my fingertips a comprehensive well researched template of corrective exercises, which can then be further individualised to a clients specific needs. Coming from a background in scientific research, the evidence-based approach of the rehab protocols from erepsonline is of fundamental importance to me. On a practical level, it offers a time saving solution to the arduous task of organising client programs in a busy practice. Having been a manual and exercise therapist for over 25 years, patient compliance and progressive functional independence has always been an issue. Erepsonline is a user-friendly, effective tool that eliminates practitioner frustration and patient confusion when it come to exercise prescription and rehabilitation programming. Clear, precise and detailed progressive evidence-based exercise protocols (including photos) with outcome measures that make developing and monitoring patients programs and progress effortless. Erepsonline is comprehensive, unbelievably effective and so incredibly time efficient that it seems illegal. As an exercise physiologist I find myself constantly writing programs for clients to overcome their physical deficiencies. Erepsonline provides me with research based protocols that I can specifically design to my clients needs. This software is so user friendly and a great time saver for all practitioners in the fitness industry. Erepsonline has made me so time efficient that my business and family life have benefited greatly. Thank you erepsonline for all your hard work. Founder of Eternal Body Health. It is a unique innovation. I would recommend erepsonline without hesitation to any health care professional. Get erepsonline for your practice! These are some of our customers using the erepsonline systems. © 2014-2018. EREPSONLINE PTY LTD. All rights reserved.